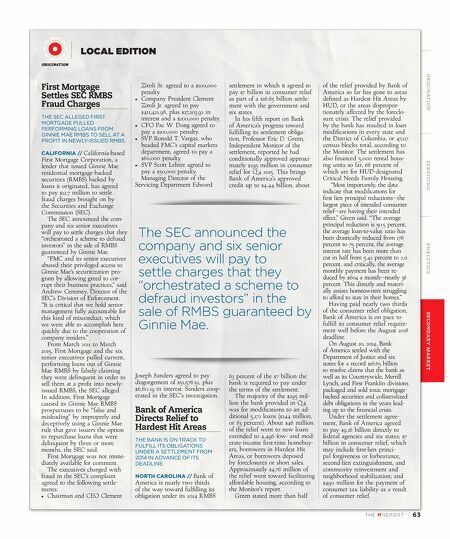 TH E M R EP O RT | 63 O R I G I NAT I O N S E R V I C I N G A NA LY T I C S S E C O N DA R Y M A R K E T SECONDARY MARKET THE LATEST ORIGINATION LOCAL EDITION First Mortgage Settles SEC RMBS Fraud Charges THE SEC ALLEGED FIRST MORTGAGE PULLED PERFORMING LOANS FROM GINNIE MAE RMBS TO SELL AT A PROFIT IN NEWLY-ISSUED RMBS. CALIFORNIA // California-based First Mortgage Corporation, a lender that issued Ginnie Mae residential mortgage-backed securities (RMBS) backed by loans it originated, has agreed to pay $12.7 million to settle fraud charges brought on by the Securities and Exchange Commission (SEC). The SEC announced the com - pany and six senior executives will pay to settle charges that they "orchestrated a scheme to defraud investors" in the sale of RMBS guaranteed by Ginnie Mae. "FMC and its senior executives abused their privileged access to Ginnie Mae's securitization pro - gram by allowing greed to cor- rupt their business practices," said Andrew Ceresney, Director of the SEC's Division of Enforcement. "It is critical that we hold senior management fully accountable for this kind of misconduct, which we were able to accomplish here quickly due to the cooperation of company insiders." From March 2011 to March 2015, First Mortgage and the six senior executives pulled current, performing loans out of Ginnie Mae RMBS by falsely claiming they were delinquent in order to sell them at a profit into newly- issued RMBS, the SEC alleged. In addition, First Mortgage caused its Ginnie Mae RMBS prospectuses to be "false and misleading" by improperly and deceptively using a Ginnie Mae rule that gave issuers the option to repurchase loans that were delinquent by three or more months, the SEC said. First Mortgage was not imme - diately available for comment. The executives charged with fraud in the SEC's complaint agreed to the following settle- ments: • Chairman and CEO Clement Ziroli Sr. agreed to a $100,000 penalty. • Company President Clement Ziroli Jr. agreed to pay $411,421.98, plus $27,203.92 in interest and a $200,000 penalty. • CFO Pac W. Dong agreed to pay a $100,000 penalty. 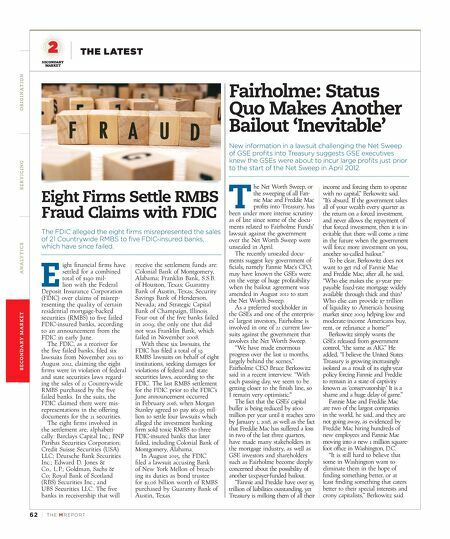 • SVP Ronald T. Vargas, who headed FMC's capital markets department, agreed to pay a $60,000 penalty. • SVP Scott Lehrer agreed to pay a $50,000 penalty. Managing Director of the Servicing Department Edward Joseph Sanders agreed to pay disgorgement of $51,576.51, plus $6,811.19 in interest. Sanders coop - erated in the SEC's investigation. Bank of America Directs Relief to Hardest Hit Areas THE BANK IS ON TRACK TO FULFILL ITS OBLIGATIONS UNDER A SETTLEMENT FROM 2014 IN ADVANCE OF ITS DEADLINE. NORTH CAROLINA // Bank of America is nearly two thirds of the way toward fulfilling its obligation under its 2014 RMBS settlement in which it agreed to pay $7 billion in consumer relief as part of a $16.65 billion settle- ment with the government and six states. In his fifth report on Bank of America's progress toward fulfilling its settlement obliga - tion, Professor Eric D. Green, Independent Monitor of the settlement, reported he had conditionally approved approxi- mately $295 million in consumer relief for Q 4 2015. This brings Bank of America's approved credit up to $4.44 billion, about 63 percent of the $7 billion the bank is required to pay under the terms of the settlement. The majority of the $295 mil - lion the bank provided in Q 4 was for modifications to an ad- ditional 5,172 loans ($244 million, or 83 percent). About $46 million of the relief went to new loans extended to 4,496 low- and mod- erate-income first-time homebuy- ers, borrowers in Hardest Hit Areas, or borrowers deposed by foreclosures or short sales. Approximately $4.76 million of the relief went toward facilitating affordable housing, according to the Monitor's report. Green stated more than half of the relief provided by Bank of America so far has gone to areas defined as Hardest Hit Areas by HUD, or the areas dispropor - tionately affected by the foreclo- sure crisis. The relief provided by the bank has resulted in loan modifications in every state and the District of Columbia, or 47,117 census blocks total, according to the Monitor. The settlement has also financed 5,000 rental hous - ing units so far, 68 percent of which are for HUD-designated Critical Needs Family Housing. "Most importantly, the data indicate that modifications for first lien principal reductions—the largest piece of intended consumer relief—are having their intended effect," Green said. "The average principal reduction is 50.5 percent, the average loan-to-value ratio has been drastically reduced from 178 percent to 75 percent, the average interest rate has been more than cut in half from 5.42 percent to 2.11 percent, and critically, the average monthly payment has been re - duced by $604 a month—nearly 38 percent. This directly and materi- ally assists homeowners struggling to afford to stay in their homes." Having paid nearly two thirds of the consumer relief obligation, Bank of America is on pace to fulfill its consumer relief require - ment well before the August 2018 deadline. On August 20, 2014, Bank of America settled with the Department of Justice and six states for a record $16.65 billion to resolve claims that the bank as well as its Countrywide, Merrill Lynch, and First Franklin divisions packaged and sold toxic mortgage- backed securities and collateralized debt obligations in the years lead - ing up to the financial crisis. Under the settlement agree- ment, Bank of America agreed to pay $9.16 billion directly to federal agencies and six states; $7 billion in consumer relief, which may include first-lien princi - pal forgiveness or forbearance, second-lien extinguishment, and community reinvestment and neighborhood stabilization; and $490 million for the payment of consumer tax liability as a result of consumer relief. The SEC announced the company and six senior executives will pay to settle charges that they "orchestrated a scheme to defraud investors" in the sale of RMBS guaranteed by Ginnie Mae.